Get the beautiful smile you’ve always wanted — without braces! Invisalign is the invisible way to straighten your teeth using a series of custom-made, nearly undetectable aligners. Whether your teeth are crowded or too far apart, ask Dr. Martin if Invisalign is the right choice for you. After setting up your treatment goals at the initial consultation, Dr. Martin will meet with you for a records appointment – which consists of taking very precise impressions of your teeth. With Invisalign, your impressions are scanned with a 3D imaging technology, and virtual models of your teeth are created. Dr. Martin then uses advanced 3D imaging software to individually position each tooth in order to achieve the best possible smile. Invisalign will then create a graphical representation of Dr. Martin’s treatment plan – almost like an animated movie of the way your teeth will move from the current position to the final desired position. Once Dr. Martin has reviewed and approved of this treatment plan, Invisalign will produce a series of clear, plastic aligners that correspond to the stages of tooth movement in the animated movie. Patients are asked to wear each clear aligner for a period of 2-3 weeks before switching to the next set in the series. Week by week, the patient’s teeth are straightened with a light gentle pressure. In order to monitor your progress, Dr. Martin will want to see you every six weeks, and you will be given three new sets of clear aligners. Dr. Martin and Invisalign recommend you wear the clear aligners for 22 hours a day, taking them out only to eat, brush and floss. Remember — the more compliant you are about wearing your aligners, the more impressive your final smile is going to be! 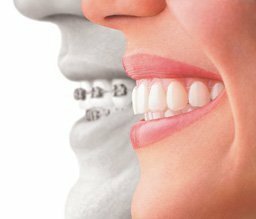 At Dr. Martin Braces, we feel that most of our adult patients — providing they have their second molars – who have light to moderate tooth irregularities can successfully be treated with Invisalign, and achieve the smile of their dreams. Since Invisalign treatments are only suggested for adults with light to moderate tooth discrepancy, the total time in treatment tends to be shorter than conventional orthodontic treatment with braces. One of the biggest advantages of Invisalign is that there is nothing you cannot eat or drink, because your aligners are removable! Simply remove your aligners, and then enjoy any of your favourite foods. Please remember to brush your teeth before replacing the aligners in your mouth. Dr. Martin and his team suggest that you brush your aligners every time you brush your teeth. You can use a regular toothbrush and toothpaste, and can also soak them once a day — using orthodontic retainer tablets – for a fresh, minty taste. Removable: You can eat and drink with no restrictions. Better oral hygiene: You can brush and floss normally to maintain healthy teeth and gums. Comfortable: There are no wires, metal pieces or brackets to cause mouth abrasion.